Queen of Peace High School has been educating young women for more than five decades in an environment that nurtures and empowers each individual to become confident, competent and courageous women ready to succeed in the world. 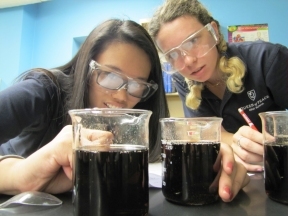 Queen of Peace utilizes the nationally recognized Project Lead the Way curriculum that focuses on STEM (science, technology, engineering and math) content. Through this coursework students have access to subject areas that would typically only be available at the collegiate level including: biomedical science and civil and architectural engineering. Successful completion of these PLTW courses yields college credit. The STEM focus at Queen of Peace stretches outside the walls of the classroom and into extracurricular activities including the Robotics Team, Mathematics Team and the Environmental Task Force. Queen of Peace also strives to bring STEM to life by partnering with some of the leaders in those fields including: Women’s Energy Network, Caterpillar, Navistar, Khan Academy and the Illinois Institute of Technology. Queen of Peace is sponsored by the Dominicans of Sinsinawa and is located at 7659 S. Linder, Burbank, Illinois. To register for Open House or to schedule a shadow day please contact Aubrie Rizzo at rizzoa@queenofpeacehs.org or 708.496.4752.